Does Your Dog Feel Jealous, Or Is That A Purely Human Flaw? : Shots - Health News Dog owners don't doubt that their pooch has feelings. But scientists aren't so sure. An experiment found that dogs act upset, dare we say jealous, when their owners ignore them for a stuffed animal. Oh, I don't wanna share you with nothing else, I gotta have you to myself. When you kiss your husband, does your dog try to get your attention? And does that mean that your dog feels jealous? Threatened? Or are we just imagining that? Many if not all dog owners are sure that their pets have feelings. And we've known for a while that animals exhibit behaviors that look like jealousy, guilt and shame. But it's hard to find out what animals are really feeling. And researchers say that understanding that could give us valuable insights into human emotions, too. 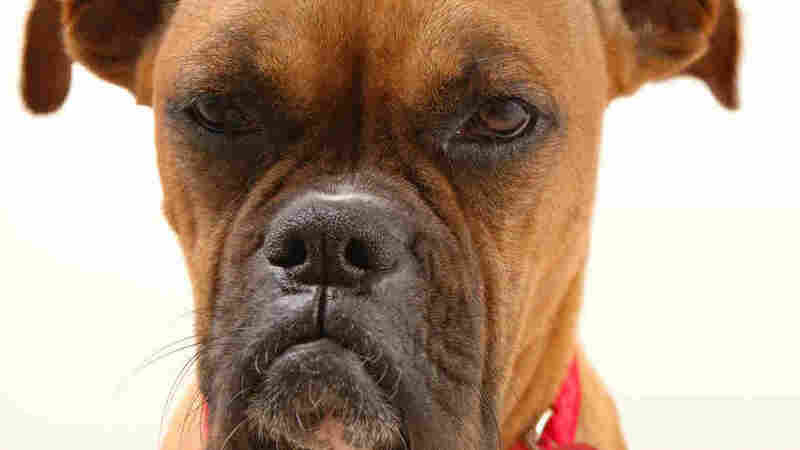 A study published Wednesday in PLOS ONE has brought us a tiny bit closer to proving that dogs do get jealous. Psychologists from the University of California, San Diego adapted a test that has been used on human infants to see whether dogs exhibit jealous behavior. They videotaped how 36 dogs reacted to their owners ignoring them and instead petting and talking sweetly to a plastic jack-o'-lantern or an animated, stuffed dog. When their owners were interacting with the stuffed animals, over three-quarters of the dogs pushed or touched their owners. The dogs also tried to get in between the stuffed animal and the owners, or growled at the plush pets. The dogs seemed less jealous of the jack-o'-lantern. But 40 percent acted aggressive when their owners started talking to the plastic pumpkins. Psychologist Christine Harris, who led the study, says she's been studying jealousy for many years — but in humans. "The motivation that you have when you're jealous is to really break up the liaison between your loved one and your rival," she told Shots. The fact that these dogs seemed like they were trying to draw their owners away from the stuffed animal indicates that they're feeling something very similar to human jealousy, Harris says. "This is really a landmark study," says Marc Bekoff, an emeritus professor of evolutionary biology at the University of Colorado in Boulder, and author of Why Dogs Hump and Bees Get Depressed. "It opens the door to a lot more research on animal emotion." Bekoff, who wasn't involved in the research, says that he's definitely seen what looks like jealousy in his work with not only dogs but also coyotes and wolves. But this study is one of the first controlled experiments that tries to show it. Of course, the study still doesn't prove that dogs feel jealousy. "The problem is that [the researchers] didn't look at how dogs would react just to those objects," says Laurie Santos, director of the Canine Cognition Center at Yale University. It could be that the dogs were jealous of the stuffed animal, Santos says. Or it could be that the dogs really distrusted the stuffed animal and were acting out of fear. But this study does build on previous research that shows dogs react negatively when they're treated unfairly, she tells Shots. "This is a very new science. We are just developing new tools to better understand animal emotions." In humans, jealousy can be a very complex emotion, Santos says. It can bring up a host of other emotions like anger and rejection. And when humans feel jealous, we start suspecting and speculating, she says. "We think, 'If my husband is talking to another woman, maybe he's cheating.' "
If we find out that dogs feel the same way, she says, "either jealousy is less complicated because animals show it, or animals are more complicated than we thought."